Decided to splurge on the newest iPhone you’re now holding in your hand? That’s great! Don’t forget to protect your latest investment with the best iPhone case money can buy. 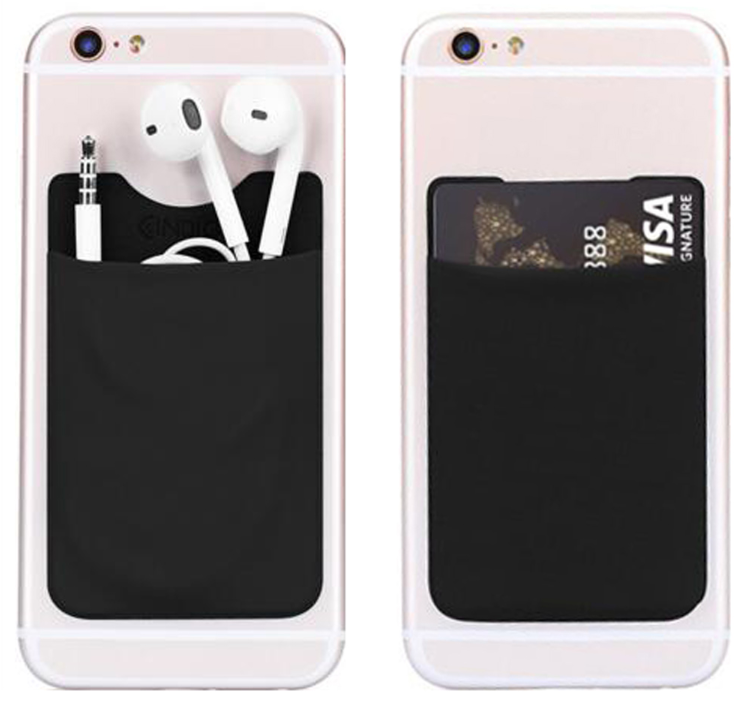 Get these iPhone Xs Max card holder cases if you’d like a case that protects your iPhone from drops, spills and scratches while it doubles a mini-holder for your IDs, credit card or bus card. The kicker? These cases come with free express shipping worldwide for the ultimate buying experience. Take one look at the Luxury Leather Card Holder Case and you’ll instantly fall in love with the premium leather material, replete with realistic stitching on the back. The classic design exudes sophistication while providing unmatched utility for those who want more than just a case. 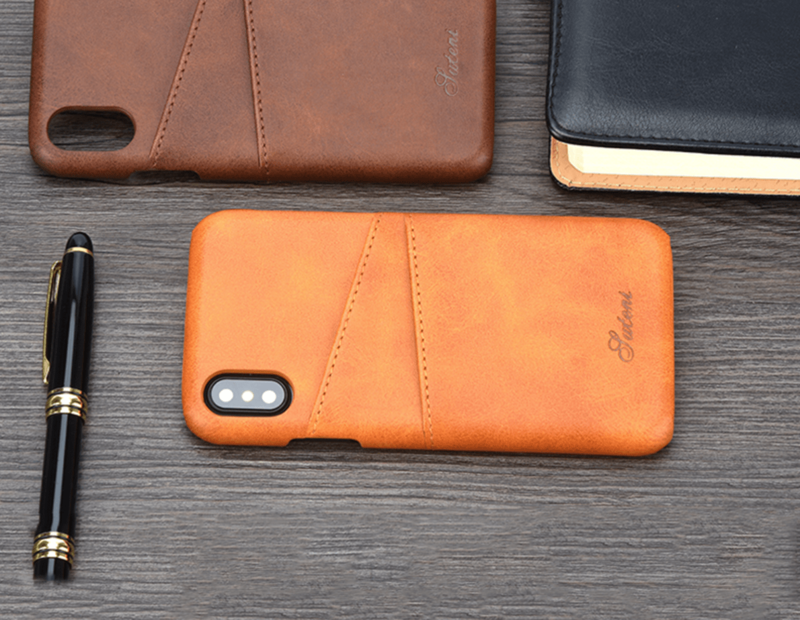 The slim case combines a tough PC shell, PU leather and a soft lining for your iPhone. You can choose from Black, Blue, Brown, Khaki and Red. 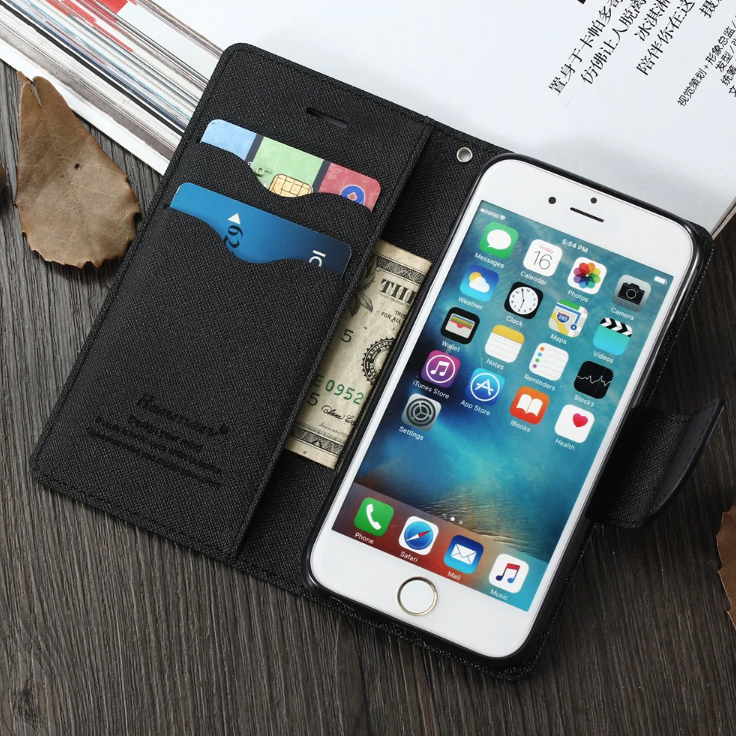 Aside from making your newest iPhone stand out from the crowd, the case holder functions as a holder for your credit card or ID while protecting your device from dust, dirt, scratches, bumps and the occasional drop. You get a very snug fit and notches for the power, volume rocker and the charging port. The rear camera is safe from surface scratches due to the raised lining. It’s the ultimate iPhone case when you need style and function. Sometimes you just want to get the best kind of protection for your newest iPhone. Case in point- the Sliding Card Case is extra tough, super durable and can take a beating when you’re out and about. It works as an armor to ward off dirt, dust, scratches and falls, thanks to the shock absorption technology and air-cushioned corners! The case is built with perfect cut-outs for your iPhone’s volume buttons, charging port and speakers, and raised levels for the rear camera. The back of the case seems to be ordinary until you slide out the PC material to reveal a nifty compartment space. With it, you’ll be able to store up to 2 cards (ID, credit or bus) or as a mini-wallet for your cash. What’s more, you can personalize the case by choosing from a variety of colors, including Black, Golden, Grey, Silver, Blue, Navy Blue, Red, Green, Pink and White. Turn your iPhone into an ultra-stylish book wallet with the Thin Leather iPhone Wallet Case. Aside from providing a full 360-degree protection, you can choose between low-key (All Black, Black Brown) or striking color combinations (Blue Green, Mint Blue, Pink Rose, Purple Blue, Rose Blue or Red Blue) depending on your mood and preference. 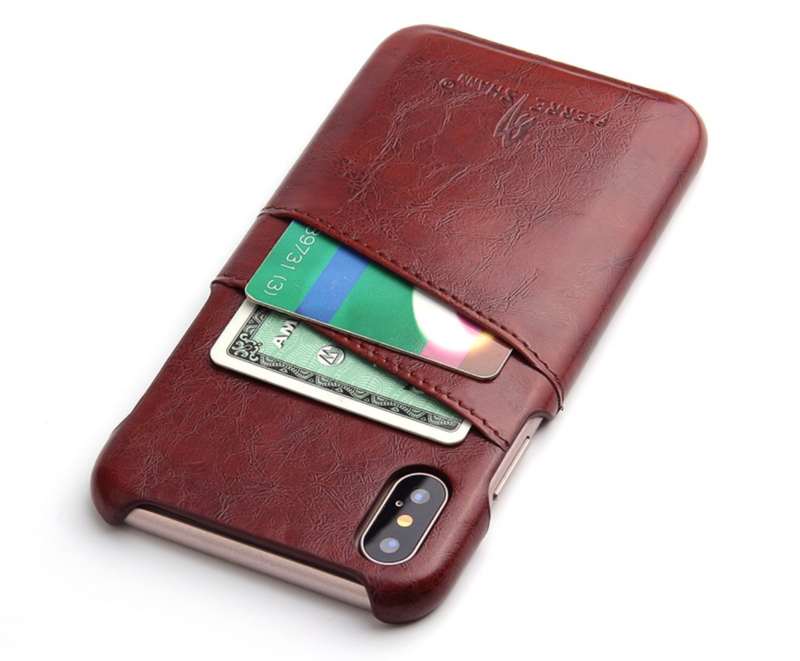 It’s everything you could hope for an iPhone wallet case. The material is made of high-quality TPU rubber and PU leather, which protects your device from impacts, dust and scratches. Pulling on the magnetic lock cover reveals two slots for your card and a sleeve for your bills. You can prop up your iPhone for hands-free calling and for watching videos. 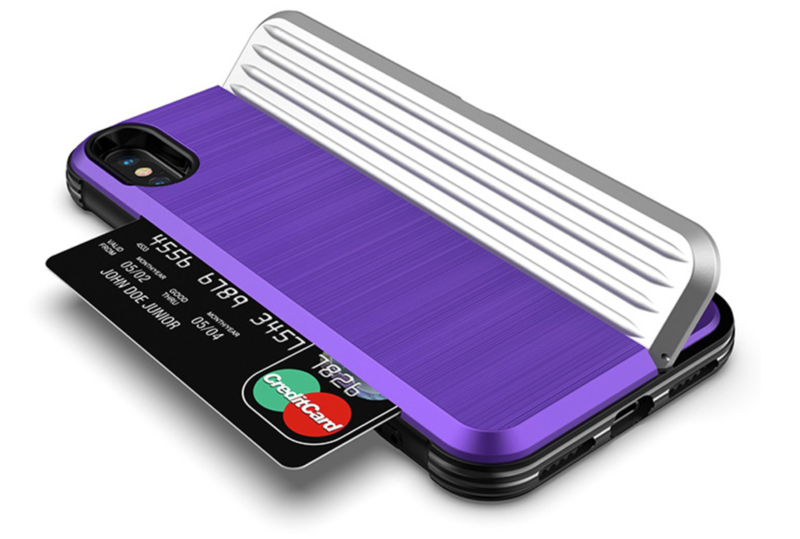 With the wallet phone case you won’t ever have to worry about leaving the house without cash or credit. You also won’t have to take your iPhone out the cover when you need to charge or use the camera. Leather is an exquisite material that never seems to go out of style. 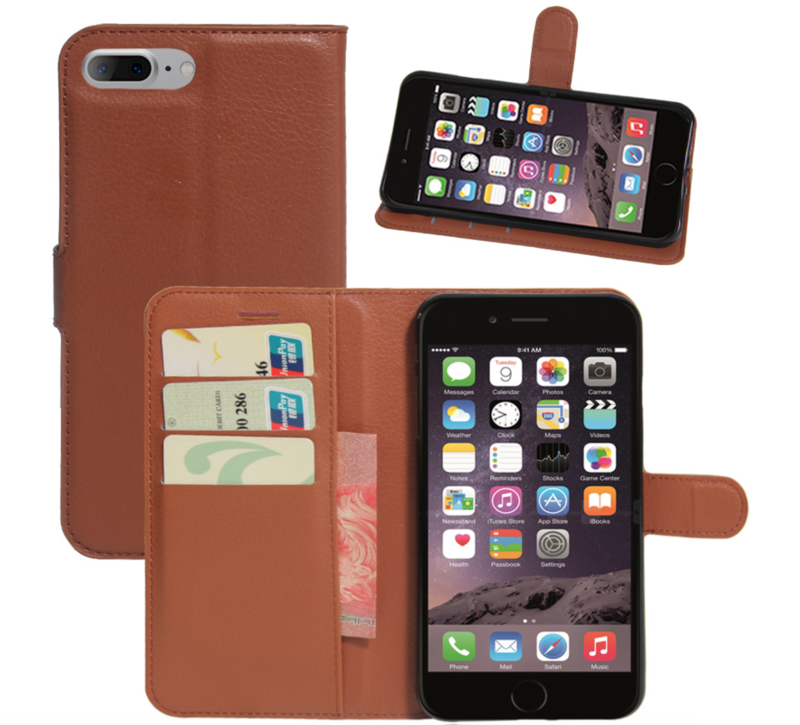 If you need a case that looks just as good as your new iPhone, you can’t go wrong with the Multi-Card Wallet Leather Case. The premium PU leather sports stitching and adds a nice touch. Open the magnetic catch and you can access to two card slots on the right side. On the left section, there’s an opening to put your bills or an extra card in. Closing the compartment is as easy as letting the magnet do its job. But that’s not all. Prop the back cover and you’ll be able to watch videos or play games without having to hold your iPhone. At the front, hard PC material protects your precious device from everyday use, absorbing shocks, impact and knocks and damage. You can even choose from several color options, including White, Red, Blue, Brown or Black. Flip cases are perfect when you need 360-degree protection for your iPhone. The Flip Wallet Leather Case adds undeniable class and an array of function that adds to a pleasant overall experience. For instance, you can turn the catch, expose the cover and reveal two side card slots for your credit card or ID. There’s also a sleeve for securing your paper bills, receipts or small documents in. Closing the cover secures the contents and covers your iPhone’s screen. The wallet card case can act as a stand for when you need to prop up your device for video calls or for watching entertainment. Soft material cradles your iPhone and holds it in place. When closed, your investment is protected from spills, scratches and the occasional knocks and falls. Stitching design is roughly the same color as the case itself, which you can get in Rose, White, Brown, Blue and Black. Business style cases are perfect for entrepreneurs and businessmen who want their phone cases to match their suit, leather bag and shoes. 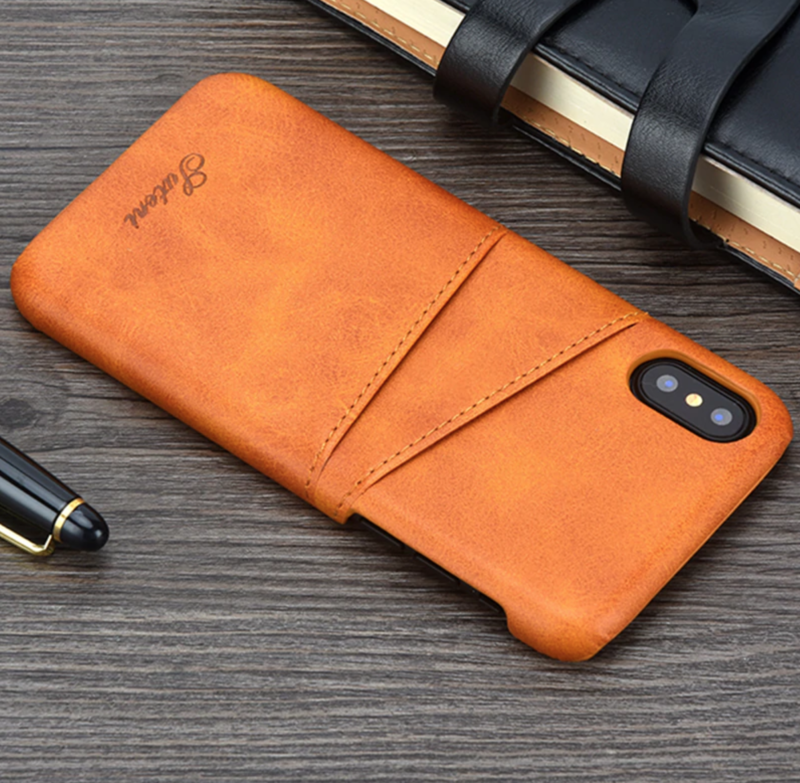 The Luxury Leather Flip Wallet Case may look like your everyday cover, but open up the magnetic button and you’ll be in for a pleasant surprise. Instead of the flip cover working as a hinge, the catch lies at the bottom of the iPhone wallet case. Inside, there’s a slot for two cards or IDs, with a sleeve that works as a personal photo frame. Here, you can put a photo of a loved one or a scenic photo that you captured during your vacation. The cover can also work as a kickstand for when you’re watching videos or cooking through a recipe. Slide your iPhone into the case and it will be protected from skids, scratches, dirt and the occasional drop to the pavement, giving you maximum value for money. It’s not everyday that we see something innovative, but the Sticky Pocket Case is so unique that it deserves a special mention. 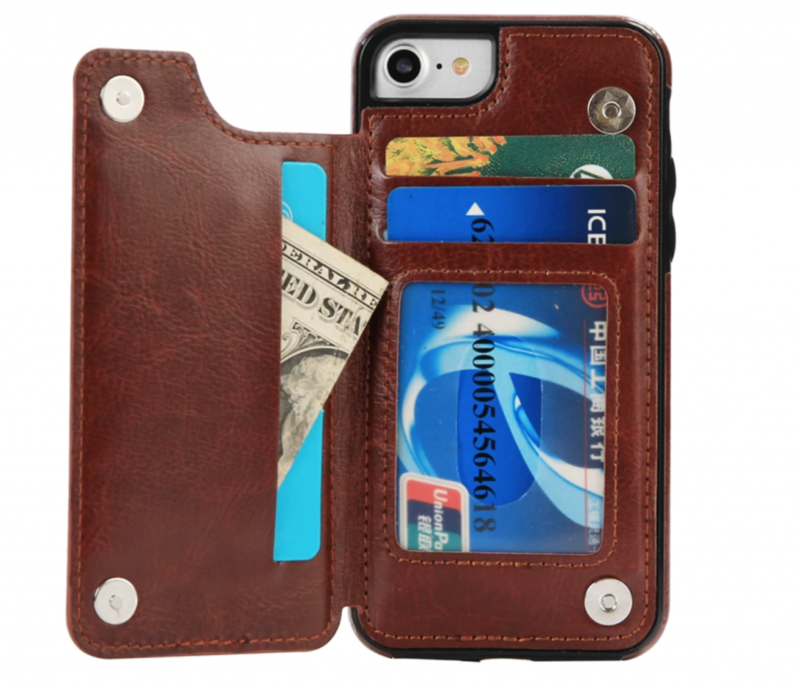 Ever wanted your iPhone case to hold more than just credit cards, ID or bills? Maybe you’d want a place where you can put your Apple earbuds, your charging cable or your transit card without having to bring an extra bag. In any case, you’ll find the Sticky Pocket to be extra useful. It comes in several color options, including Darkblue, Gray, Pink, Rosegold, Gold and Black so you can mix and match themes, mood and preferences. The lycra material is stretchy and can be used to hold bills, coins and small accessories, among others. Application is easy- simply remove the plastic on the 3M tape, then affix it to the back of your iPhone case. It can even double as a cushion to prevent your iPhone from drop damage. 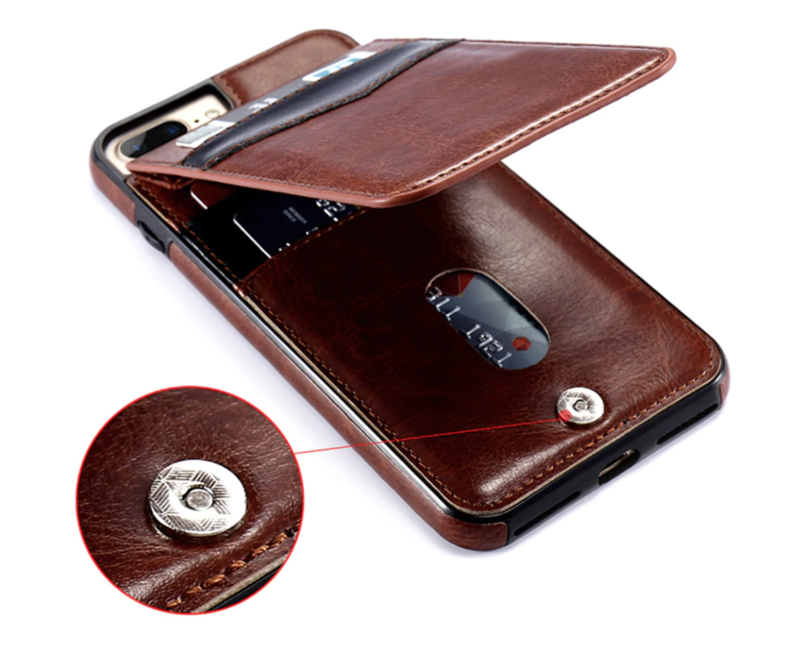 Leather wallet cases can act as a slim protector while offering a number of functions. 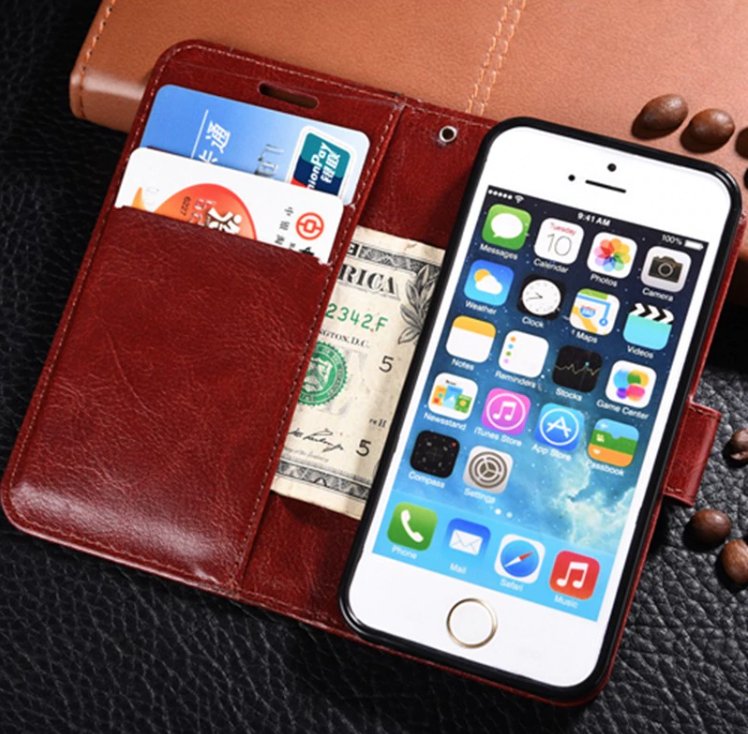 The PU Leather Wallet Case accentuates the natural beauty of your iPhone, hugging its curves while protecting your investment from dust, skids and shocks. The double slits on the back means the case can fit in several cards you’ll need to bring with you when you’re on the go. In a pinch, it can hold several bills if you’re really pressed for space. The high quality PU leather is marked with stitchings that really add to the overall visual impact. You’ll love the fact that the case gives you access to all the ports and buttons of your iPhone, including the charging port and the power on/off. The raised grooves protects the rear camera from hard surfaces. The color options are icing on the cake, allowing you to dress up your iPhone according to your personal style! The Shockproof Case is an attention-grabbing protective case that’s very easy on the eyes. The unique back cover contains not just one, but two features which you’ll find very useful. 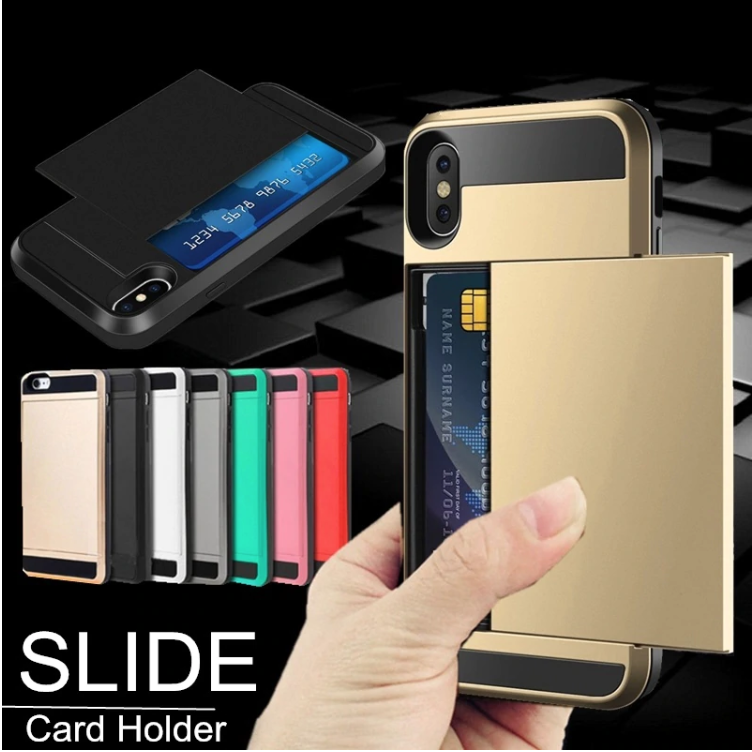 The shockproof card case comes in Black, Red Silver, Gold, Blue Silver, Rose Gold, Purple Silver, Pink Silver and Silver. The ribbed silver flap opens up to reveal a compartment where you can put your ID, credit card or transportation pass for utmost convenience. Want to watch videos and prop your iPhone up on a surface? Just flip the cover out and voila! You now have an instant kickstand. You won’t have to worry about your precious iPhone overheating during extended movie marathons and game sessions, thanks to the unique vein heat dissipation technology that disperses heat efficiently. The tough, rigid double protection construction shields your device from accidental liquid spills and impacts from falls, bumps and shocks. The Luxury Kickstand Leather Case is a veritable must-have for those who want to bring their essentials, such as their primary credit card or driver’s license with them on the go. More importantly, it comes in a myriad of colors to complement your new iPhone’s look and style. The magnetic lock reveals a cover that can hold up to 4 cards, IDs or a limited number of bills. Prop it up and the cover can be used to hold your iPhone in an optimal angle for watching videos, chatting with friends or playing games in hands-free mode. When closed, the PU leather material provides a full 360-degree protection from dirt, scratches and drops. You still get access to the most important ports, buttons and features without needing to remove the card holder case. Raised notches in the rear camera shield the delicate part from smudges and scratches that could ruin the lens.